Reviews - Kuća Bajlo | Vegetarische B&B in Zadar, Kroatië! To all the lovely people who already chose B&B Kuća Bajlo we want to say thank you! 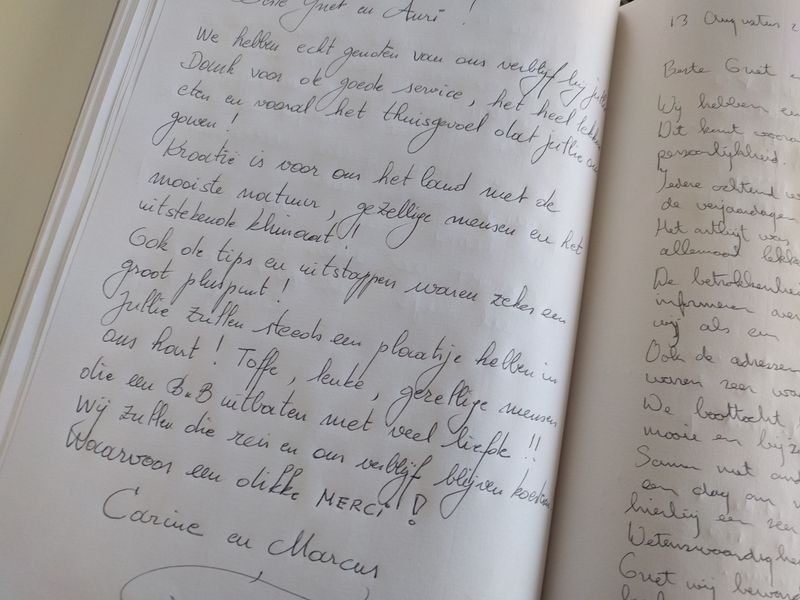 Thank you for your friendship, the nice chats, the cozy breakfasts, the beautiful texts in our guestbook, your photos and especially for your appreciation. With great pleasure we have read your reviews on Tripadvisor and Zoover. 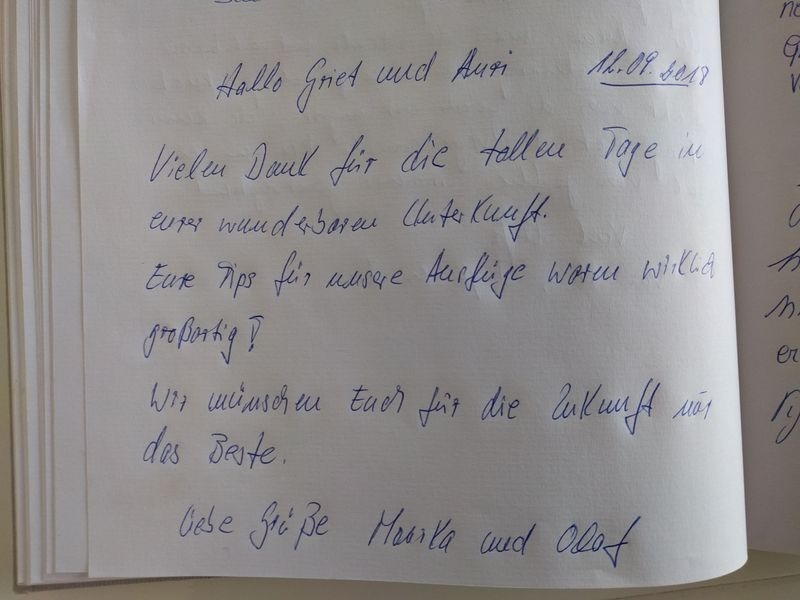 We really appreciate it, if you would be so kind to enter a fair review about your stay with us. Kuća Bajlo | Vegetarische B&B in Zadar, Kroatië! by Alix, Jonanthan on Kuća Bajlo | Vegetarische B&B in Zadar, Kroatië! We had an amazing stay and your helped exceed all of our expectations. 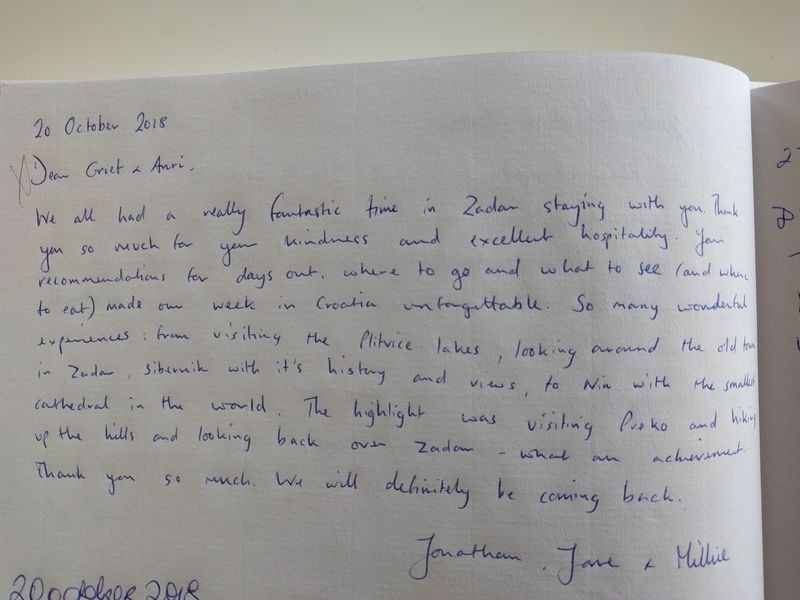 We're very glad that we chose to come to Zadar and stay at your B&B. The house, the garden and each breakfast were exquisite. We will definitely recommend Zadar and your B&B to our frinds and family in Canada. by Jonathan, Jane, Millie on Kuća Bajlo | Vegetarische B&B in Zadar, Kroatië! We had a really fantastic time in Zadar staying with you. Thank you so much for your hospitality. Your recomandations for days out, where to go and what to see and where to eat made our week in Croatia inforgettable. So many wonderful experiences: from visiting the Plitvice lakes, looking around the old town in Zadar, Sibenik with it’s history and views, to Nin with the smallest cathedral in the world. The highlight was visiting Preko and hiking up the hills and looking back over Zadar, what an achivement. Thank you so much. We will definitely be coming back. by Mike O Neill on Kuća Bajlo | Vegetarische B&B in Zadar, Kroatië! Brilliant location for a memorable holiday! Zadar is well worth a few days stay and this guesthouse is a perfect location to stay. Arni and Griet are excellent hosts and go the extra mile to ensure you have a great time. The location is really good, only a short, scenic, Waterside walk to the old town. The accommodation is of a very high standard and spotlessly clean. The breakfast is amazing and you feel great after it. You won't find better in Zadar. Enjoy! Zadar is well worth a few days stay and this guesthouse is a perfect location to stay. 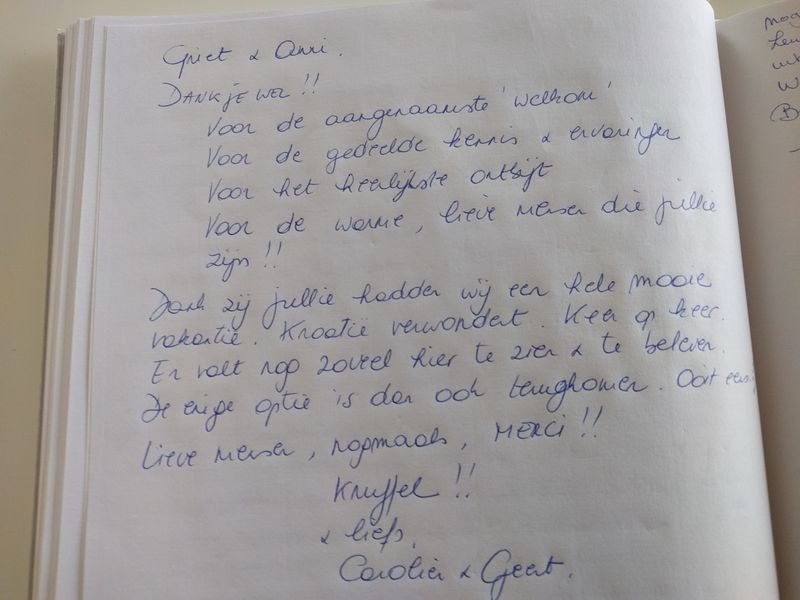 Arni and Griet are excellent hosts and go the extra mile to ensure you have a great time.